This super easy version of Chicken Pot Pie is in between the real homemade thing and the frozen version. It is yummy, simple and of course very satisfying! If chicken is not cooked already, pan fry or poach and cut into cubes, cook frozen peas in microwave and cube or slice carrots. Meanwhile thaw out dough if frozen. Preheat oven to 400degrees F. Meanwhile divide dough into even 6 or 8 parts. In Muffin pan line each cup (6 or 8) with dough leaving enough from each part for some of top. Evenly distribute part chicken, peas and carrots into each dough lined muffin. With spoon pour and spread cream of chicken soup over each letting settle. Spread remainder of pie crust on top and where possible pinch/seal crusts close. Be careful while baking if your pie crust did not seal that none of the soup boils over. Bake 25 minutes (original recipe said 40, but that was for 1 large pie not miniatures) or until crust is golden brown. 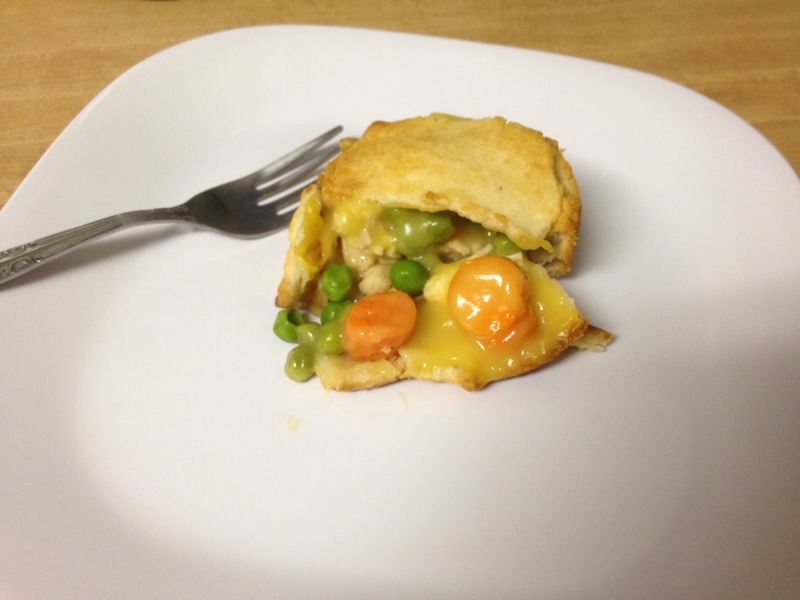 Posted in Cooking and tagged carrot, chicken, chicken pot pie, cooking, easy, fast cooking, homemade version, pea, simple on February 28, 2014 by See Lizard Art & Photography.